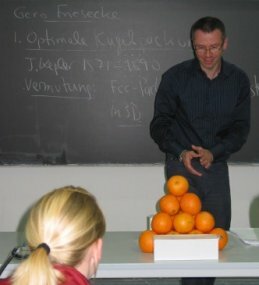 The arrangement of oranges in the picture solves an optimization problem: it takes up a minimum amount of space. The same arrangement, known as ''fcc'' (face-centred cubic), is realized in nature by atoms in many metals such as Aluminium, Nickel, Copper, Silver, and Gold. This is somewhat surprising, because the atoms solve a much more complicated optimization problem (they minimize their quantum mechanical interaction energy). Indeed, some elements such as Boron or Fluorine favour much more complex structures. For more about the mathematics of optimization problems click here.